The South Arm Cooking Club for Seniors met again at Bethel Church. For this meeting, Stella and Minoo were not able to make it and Marian was in charged of the kitchen. Perhaps, it was during the spring break, not many turned up for this kitchen. There were four seniors and four volunteers. Marian prepared four recipes for this kitchen. 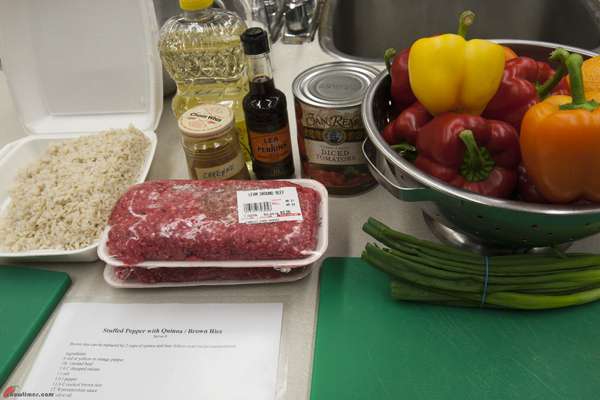 The above is Stuffed Pepper with Beef and Brown Rice. Bell peppers are in season and they are cheap. Bell pepper is also known as sweet pepper or capsicum. The green one is more pungent, that’s why Marian used the red, yellow and orange ones which are sweeter. 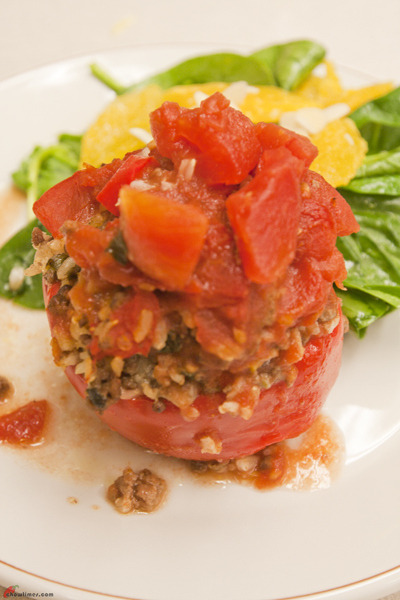 Due to the shape and hollow nature of the bell pepper, it is great to be used as a container for stuffing. Bell pepper is low in saturated fat, cholesterol and sodium. It is high in dietary fiber, Vitamin A, Vitamin B6, Vitamin C, Vitamin E, Vitamin K, Potassium, Thiamin, Riboflavin, Niacin, folate, Manganese, Magnesium and Pantothenic Acid. Bell pepper is ideal for maintaining optimum health and weight loss. You may substitute brown rice with 2 cups of quinoa. The orange juice can be substituted with lemon juice. Apart from not having someone to teach me about the cuisine, perhaps one of the things that prevents me from trying more is because I associate Mexican cuisine with beans. I just never liked beans. Never did since when I was young. Another thing too. I always thought of Mexican food as colorful food. I am not sure why. Maybe it is because of the fruits I had before or the colorful chips. 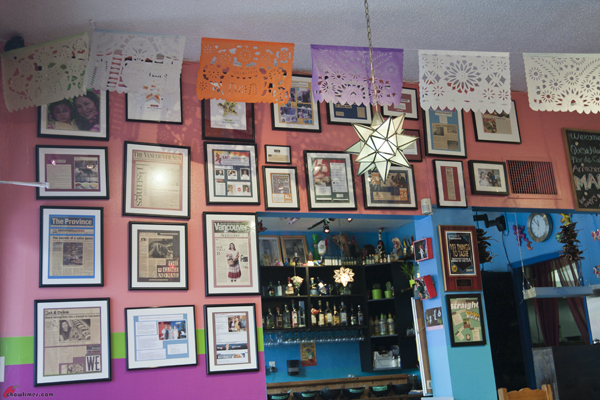 And of course … Mexican food is spicy! We met up with Mo and Patch. This is so long ago I can’t even remember when exactly it was. Maybe it was at least 2 months ago. Mo is the one who writes the EcoGreenBean blog. 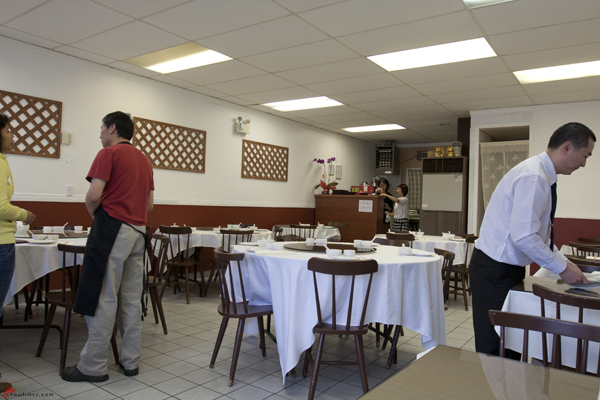 Mo suggested that we meet in Dona Cata and since we had not blogged about this place before we readily agree. 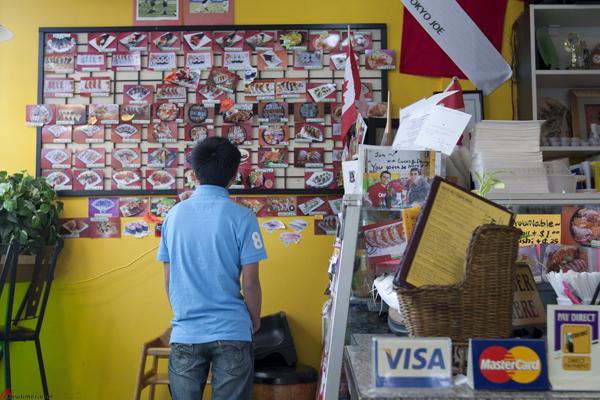 It is good that we blog about non-Asian food once in a while, right? 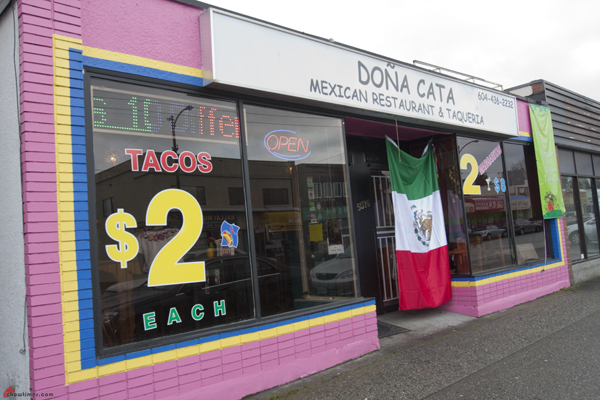 The Dona Cata is a popular restaurant, and is one of only a handful of Mexican restaurant in town. The Mexican flag draped in front of the restaurant tells me that Mexicans are proud of their flag. 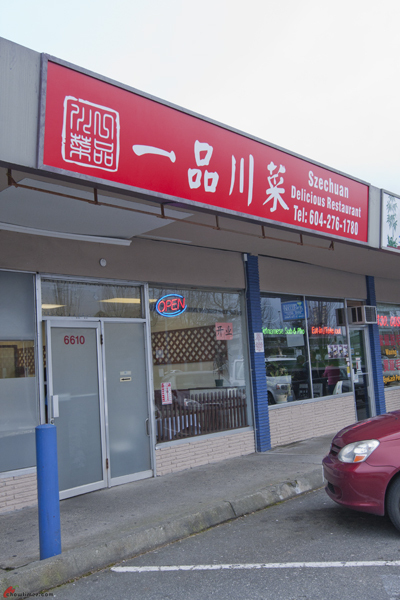 How come we don’t often see Asian restaurants have flags draped outside the restaurant is what I was trying to say. 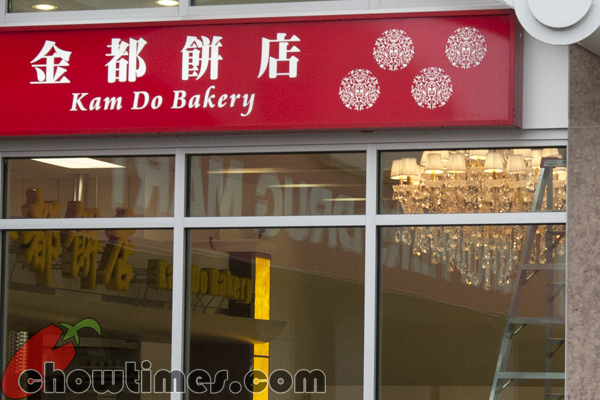 Some of you had been asking about Kam Do Bakery and when they are opening. I thought I give everyone a little update. We drove past the place today while on the way back from dining out. We saw that the paper that was covering the windows had finally been taken down. The interior looked fancy with chandeliers and all. So the question is: when is Kam Do opening? I don’t plan to blog about this place so soon and wanted to blog only sometime next week. But I think I better just go ahead and write about it since we accidentally published an unfinished post yesterday. So here goes. Tokyo Joe’s is one of those place we would have never been to up until a few weeks ago. Our boys love sushi but the thing is, Suanne hates sushi. We are trying to get her to learn to love uncooked food so that we can visit more Japanese restaurants. Believe it or not … until today I had never been to a Izakaya before and ironically Suanne had. She went to Guu in Aberdeen. 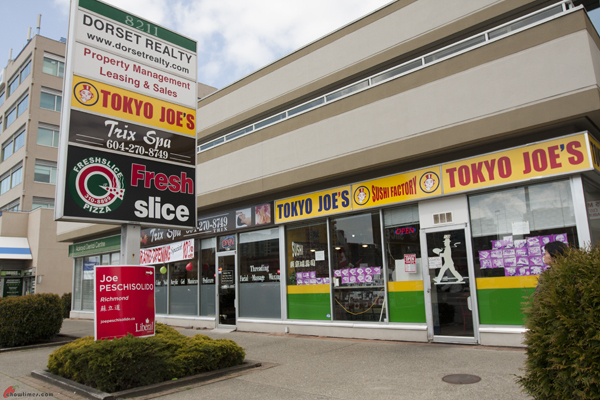 In other thing that prevents us from giving Tokyo Joe’s a second glance is the name. It’s full name is Tokyo Joe’s Sushi Factory. The words “Joe” and “Factory” just does not evoke images of quality sushi. We went this time. 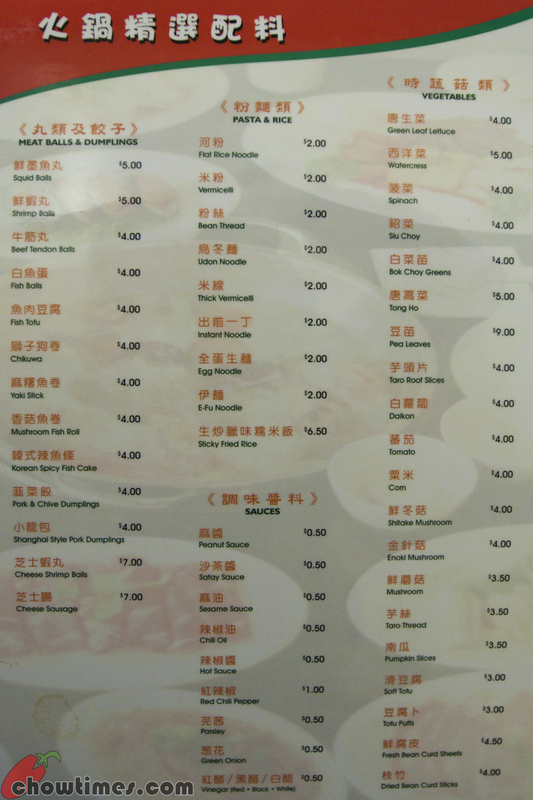 The boys wanted sushi and I said I will not go for sushi if mummy does not take at least one piece of sushi. Hehehe … that worked. Suanne will do anything for the boys. Of course just so that she does not back out, we all shook hands to seal the deal. Lorna partnered with Emily to demonstrate at the South Arm Community Kitchen. While Emily made a soup and 2 side dishes, Lorna made a main dish. 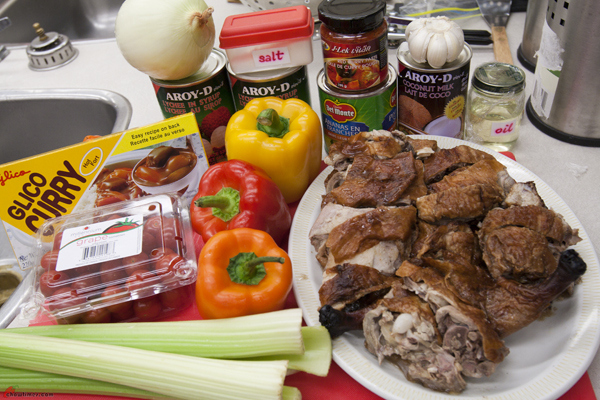 Lorna made a Curry Roasted Duck with Lychee. 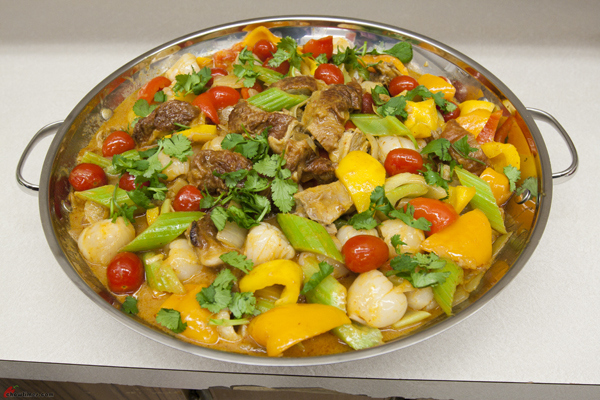 This dish is very colourful and it makes a great potluck dish. You may substitute the roasted duck with fresh tofu skin pouches that had been lightly pan fried for a vegetarian curry dish. This is a mild curry dish. 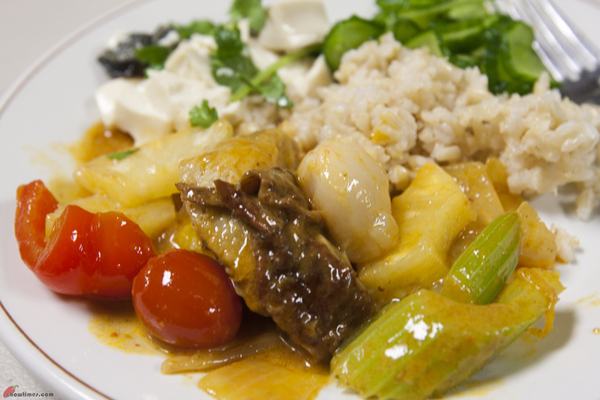 Lorna served the Curry Roasted Duck with Steamed Brown Rice. For the last dish, Emily made another side dish at the South Arm Community Kitchen. 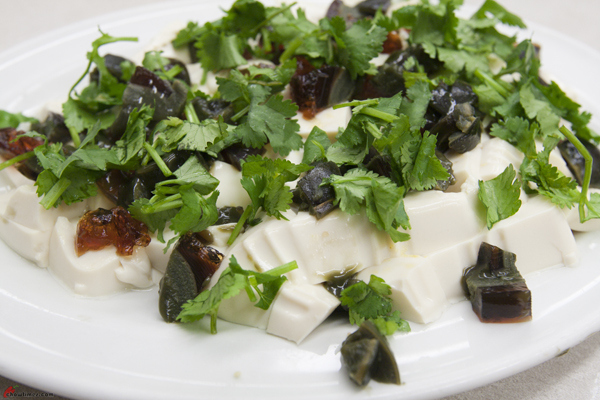 The side dish is Soft Tofu with Century Egg. This is another dish which can be made in less 10 minutes. 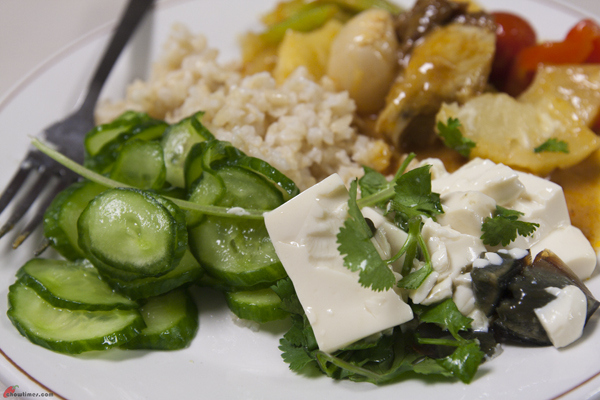 This dish does not need cooking except to warm up the soft tofu. You can steam the tofu or microwave it. 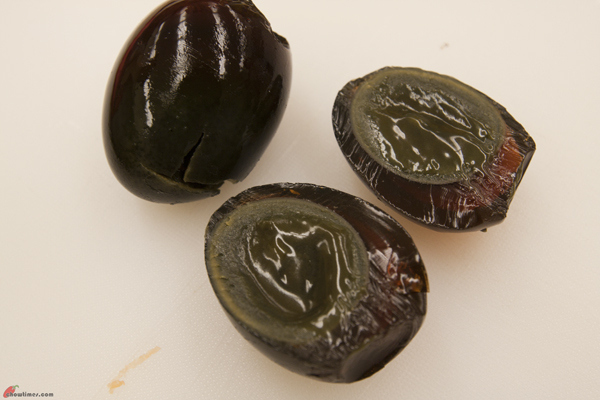 Century egg is also known as preserved egg, thousand-year old egg or Pidan in Mandarin. Century egg is made by preserving eggs in a mixture of clay, ash, salt, lime and rice hulls for several weeks to several months, depending on the method of processing. Through the preservation process, the yolk becomes a dark green or gray creamy yolk while the egg white becomes a translucent dark brown jelly like. 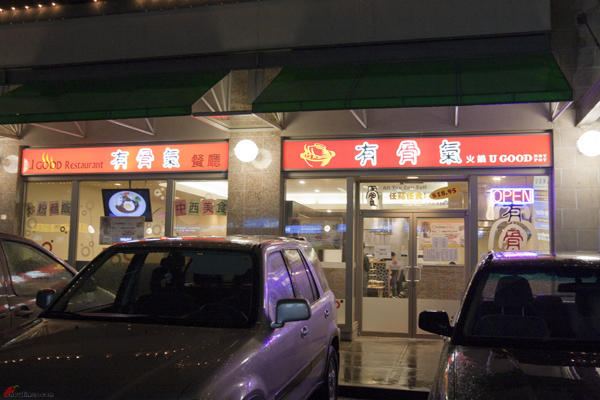 Century egg is an acquired taste because it has an odor of sulphur and ammonia. 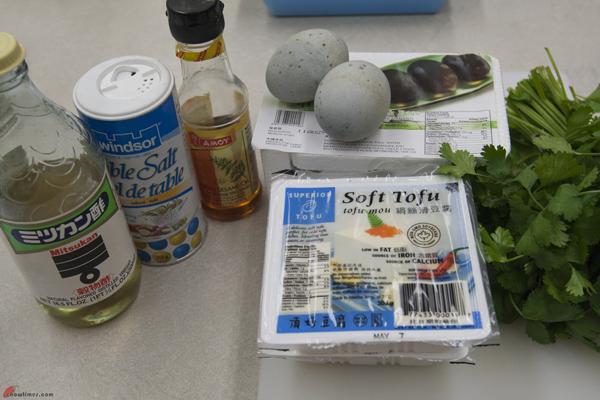 You may substitute the century eggs with meat floss. For the second dish, Emily made a simple Dace Fish Soup in the South Arm Community Kitchen. 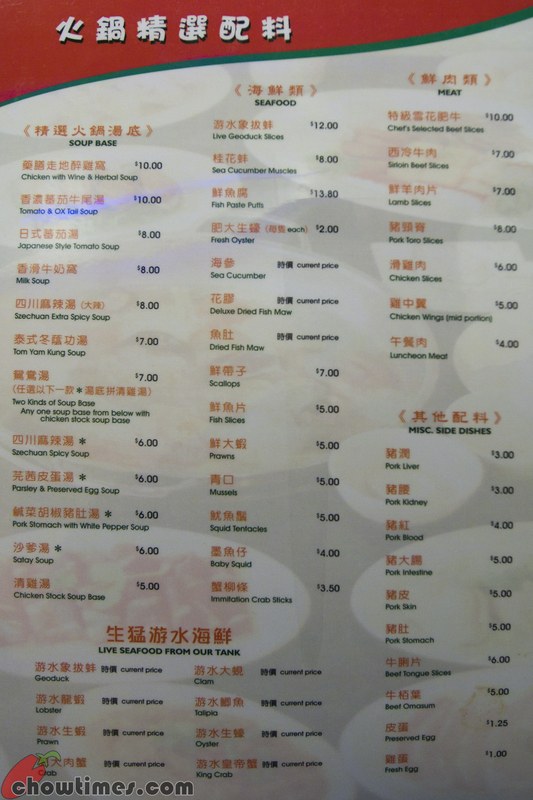 It is very common to have soup in a Chinese meal. 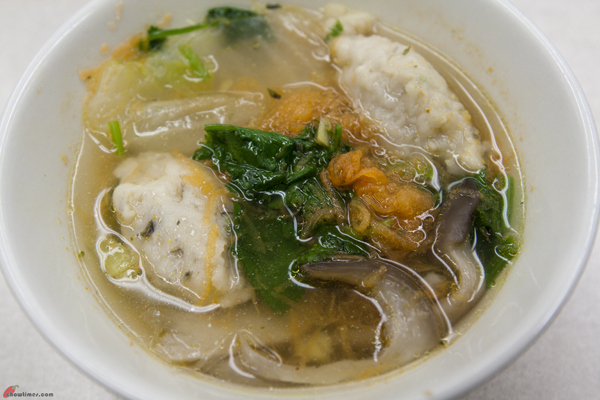 This Dace Fish Soup is made with dace fish paste which can be bought from Chinese groceries store. 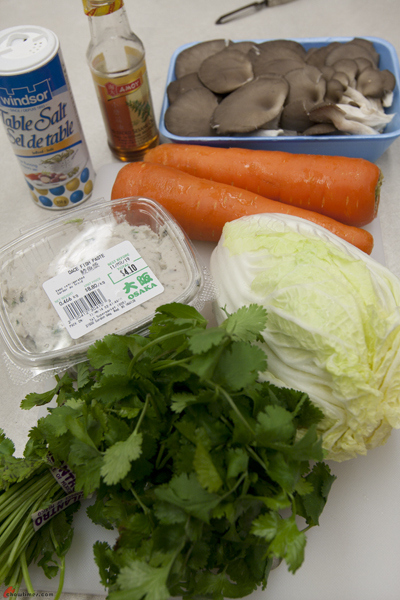 Napa cabbage and oyster mushrooms add sweetness to the soup. This soup can be made in 15 minutes. 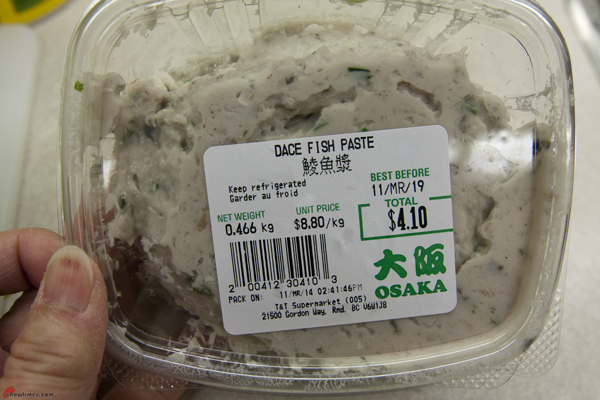 You can buy Dace fish paste in most Chinese groceries like T&T, Great One Supermarket, Great Value Asian Supermarket, etc. 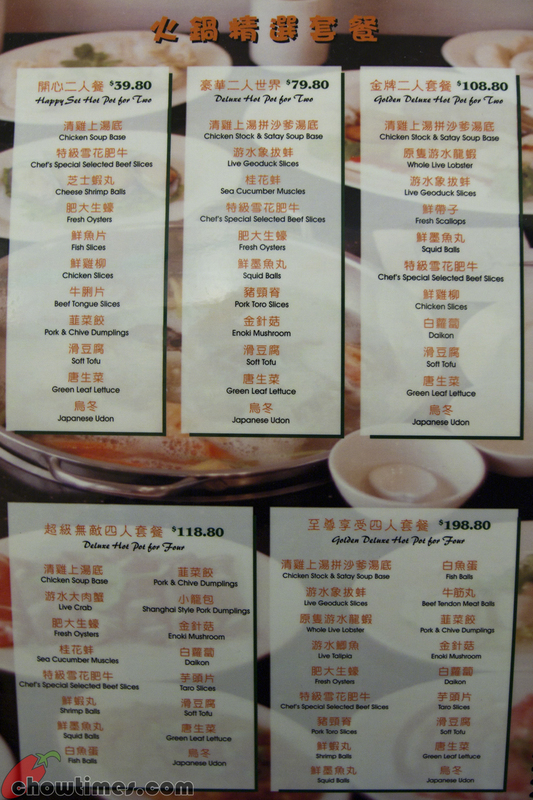 You may substitute the dace fish paste with various meat balls. Minoo requested for volunteers to demonstrate for the South Arm Community Kitchen which was temporarily held at Bethel Church while South Arm kitchen is under renovation. It looks like the renovation is going to take much longer than anticipated. Minoo got Emily and Lorna to partner up for this week’s demonstration. Emily made three simple homey dishes. 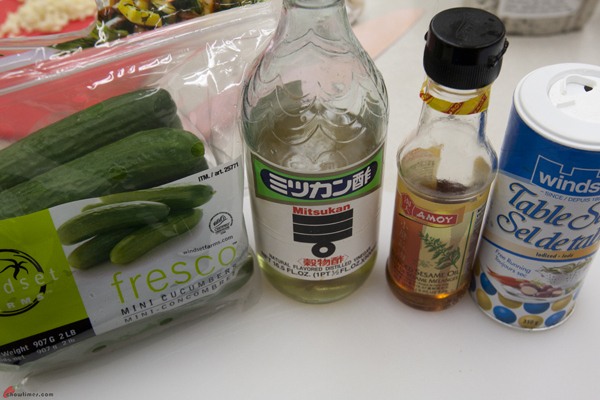 The first is a side dish of Rice Vinegar Cucumber Salad. Cucumber is a good source of Vitamin C, Vitamin A, potassium, manganese, folate, dietary fiber and magnesium. The skin of cucumber has the heaviest concentration of sterols which helps to lower cholesterol. Cucumber is a great digestive aid and have a cleansing effect on the bowel. It is low in calories and is great for people on a diet.